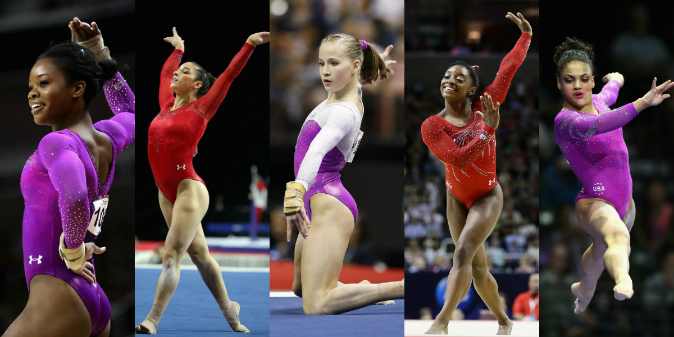 L-R (Gabby Douglas; Aly Raisman; Madison Kocian; Simone Biles; Laurie Hernandez (Credit: Ronald Martinez/Getty Images; Ezra Shaw/Getty Images; Joe Robbins/Getty Images; Ezra Shaw/Getty Images; Ezra Shaw/Getty Images). Five U.S. gymnasts will participate in the 2016 Summer Olympics in Rio de Janeiro next month, and are expecting to win plenty of gold—the U.S. team has not lost an international competition in six years. The new team has returning medalists and Olympic newcomers, including three-time world all-around champion Simone Biles. The gymnasts will head to a 10-day training camp in Texas before traveling to Brazil. With their track record, they are set to become the first U.S. women’s gymnastics team to win gold in consecutive Olympics. Gabrielle Douglas is the first African American to win the Olympic individual all-around event. She was also part of the “fierce five” that won the team gold medal at the 2012 London Olympics. “We’re going to go to Rio and just dominate,” she told TODAY after Sunday’s Olympic trials in San Jose. Douglas brings uneven bar excellence to the table in the team’s bid to win team gold again. Raisman brings her vaulting excellence to the team and lots of experience. She was also at the London games in 2012. Hernandez is the youngest and seems to become a quick crowd favorite. She competed in her first U.S. championships at the senior level in April this year. At the trials last weekend, she finished first on the beam, third on the floor, fourth on the vault, and second in the all-around. Madison Kocian is a 2015 world champion on uneven bars and a two-time World Championship team member. She was also fifth in the all-around at the national P&G Championships in April.